Our staff at the Stanley Park Nature House recently spotted a family of four river otters swimming and hunting under the ice that temporarily covered Lost Lagoon a few weeks ago. The bubbles they exhaled would get trapped under the ice and therefore reveal their route. 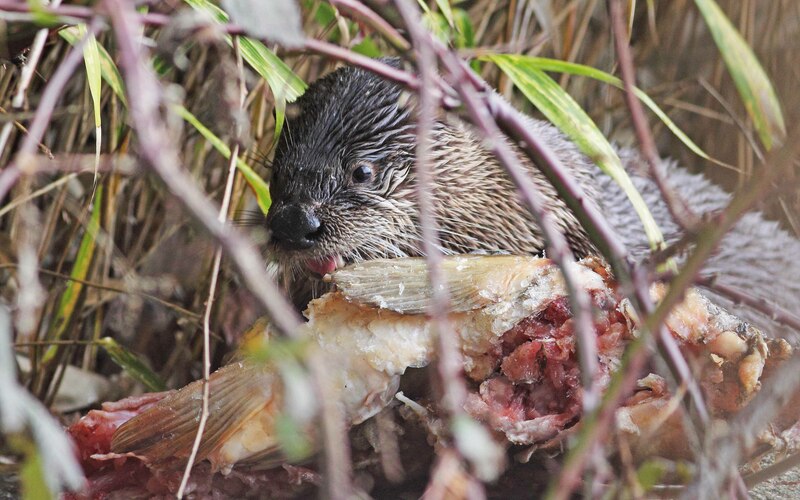 One of our volunteer photographers, Liron Gertsman, got this great picture of one of our resident otters as it was eating a carp. The North American river otter is a fascinating creature. It often digs its permanent dens along rivers, ponds and lakes, creating entrances both underwater and above ground. Inside the den, it constructs a nest of sticks, grass, reeds and leaves. River otters are fully adapted for an aquatic life, with webbed feet and a powerful tail. You can find them across Canada near waterbodies, and on the coast they feed mainly on fish as well as crabs and crustaceans which they beat with a stone to release the meat. River otters are active year-round, and are most active at night and during crepuscular hours (at dusk and dawn).